If you're already a health-conscious diner, eating better is usually about small incremental changes rather than a radical alteration of your diet. For example, replacing the butter in your cookies with vegetable oil can become part of your larger strategy to cut saturated fats. 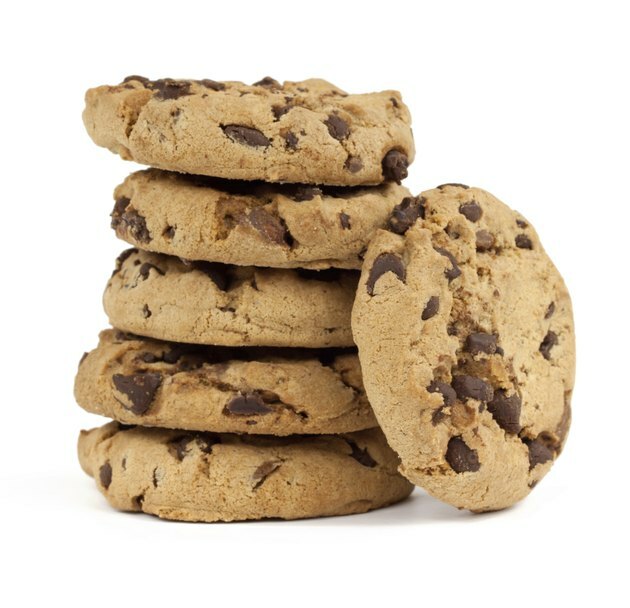 Liquid oils aren't a direct replacement for solid fats such as butter, but you can still make good cookies with a little practice and enjoy the sweet rewards in moderation. Before you start substituting ingredients in your baking, it's a good idea to understand what they do. Fats have three primary purposes in baking. First, they soften your baked goods by coating the particles of flour and preventing the formation of long, chewy gluten strands. Second, some fats, such as butter, add a richly distinctive flavor of their own. Third, solid fats play a vital role in determining the lightness and texture of the baked goods. In recipes such as cakes and especially cookies that call for the butter and sugar to be creamed together, the mixer's paddle itself and the sharp corners of the sugar crystals gouge holes in the stiff fat as the paddle whips through the butter. This creates millions of tiny air spaces in the fat, which are retained in the finished batter or dough. These air pockets expand in the oven and trap carbon dioxide from the baking powder or baking soda, giving cookies their rise and spread. Even the best of liquid oils can't duplicate this effect. You can make a good cookie with vegetable oil, but it's not a straightforward process. First, butter is only about 80 percent fat. Oil is pure fat, so only use about 3/4 of the amount called for. Otherwise your cookies will be greasy. Your cookies will tend to spread more and be flatter, and will be chewy rather than crisp. It's helpful to start with cookie recipes designed for vegetable oil before you begin adapting your own favorites. That gives you the opportunity to get a feel for oil-based dough and understand how the ingredients work together. Oil-based recipes typically make cookies with a soft, cake-like crumb, though they can have a crisp crust if you increase the quantity of sugar. Some cookies just won't work as they're supposed to without a solid fat, so you'll need to compromise a little. Try replacing just half the butter with oil, which still cuts your saturated fats but retains much of the cookies' original texture. Alternatively, use solid fats such as non-hydrogenated vegetable shortening or coconut oil in your cookies. Coconut oil is solid at room temperature, like butter, and can cream to a pleasantly light consistency. It melts at a lower temperature than butter, so if you live in a warm climate you'll need to chill both the coconut oil and your mixing bowl before you start. The Kitchn: How Do I Substitute Coconut Oil for Butter in Baking Recipes? What Do You Use to Make Muffins Lighter?